The past 10 years have been incredible for tiny homes. 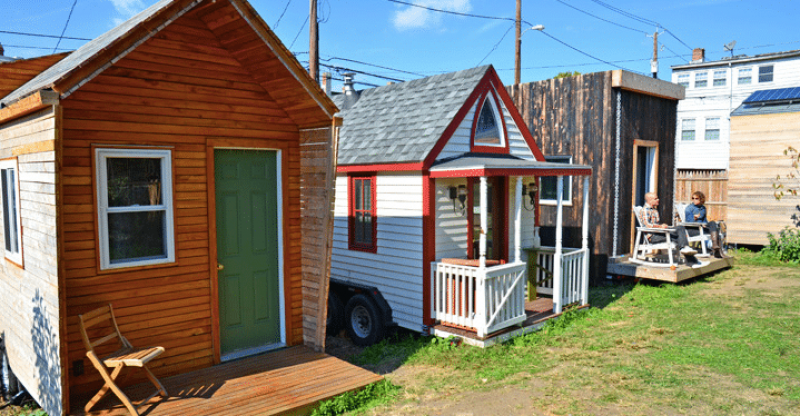 However, the history of the tiny house movement goes back much farther than a decade. In fact, popular housing site Curbed argues that the first tiny homes were the caves that prehistoric man took shelter in as he roamed the Earth looking for food. Thankfully, tiny homes have come a long way; those rock-hewn enclaves have given way to electricity, plumbing, heating and air. While we’d be hesitant to say caves were the first tiny home, we think there is all kinds of evidence pointing to the fact that the tiny home movement existed in some form long before housing shows flooded cable TV and viewers hunkered down to binge on episodes of bright-eyed individuals and couples searching for just the right tiny house. In this post, we’ll cover the timeline of the tiny house movement and include excerpts from an interview we did with one of the tiny house movement’s founding fathers, Gary Johnson. One of the motivators for buying a tiny home is simplicity – a lack of stuff leads to a sense of clarity and focus. In American history, there are few who understood that sense of clarity more than author Henry David Thoreau, whose book, “On Walden Pond”, is a favorite read among minimalists and outdoors enthusiasts for its call to a simpler life. Thoreau wrote the book during a two-year, two-month stay in a 150-square-foot cabin alongside a pond in Concord, Massachusetts. In this sentence, Thoreau gets to the heart of his philosophy of living: simplicity. It’s not about how much you own, but it’s about how content you can be with as little as possible. His cabin was a reflection of that philosophy – small, humble and sparse in its features. 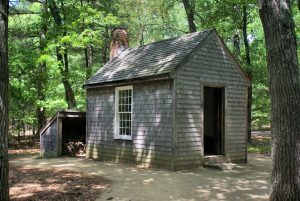 While the original cabin no longer exists, a replica was built to mimic Thoreau’s living conditions. Inside the small home are a fireplace, a bed, a desk and a chair. 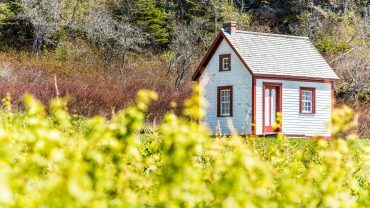 While Thoreau’s book was an influential one, it was by no means a catalyst for the tiny house movement. It wasn’t until the late 1990’s – more than 100 years later –- that a societal shift started to grow. Tiny homes slowly crept their way into the country consciousness. Several books about tiny homes surfaced here and there throughout the 70’s and 80’s, but these works focused on small structures around the world and not a formal small-house movement. The breakthrough, at least in a wider cultural sense, happened in the late 90’s when English architect Sarah Susanka wrote, “The Not So Big House: A Blueprint for the Way We Live”. Published in 1998, the book called for homeowners to think about quality over quantity – maximizing, in a design sense, smaller spaces instead of buying bigger homes. That year, according to the United States Census Bureau, the average square footage of a home had eclipsed 2,150 square feet for the first time since home sizes were tracked in 1973. Susanka’s book became an influential voice in the conversation about better spaces over bigger spaces, using various architectural principles to make smaller spaces feel bigger. Gary Johnson, one of the movement’s founders, told us that Susanka’s philosophies influenced future tiny home architects. “What Susanka was talking about is that there are ways we can design homes more efficiently and there are ways we can live in a bigger home and make it feel more spacious,” Johnson said. This is a concept that is alive and well today in at least one major city; we’ll talk about this in a few minutes. 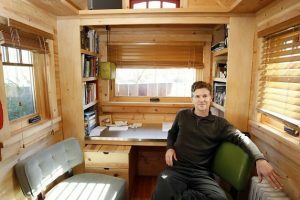 Two years after Susanka published “The Not So Big House”, a University of Iowa professor named Jay Shafer became part of the tiny house movement lore when his tiny house became the focus of a front-page feature in the Des Moines Register. Titled, “Home Sweet Hut”, the article gave readers a peek into a life that many of them had probably never even though of, let alone heard of: the tiny house lifestyle. Johnson read the article and it captivated him enough to where he asked the Register for permission to post the article on his private website. They said yes and, over the next year or so, numerous people contacted Johnson about Shafer and the tiny home. The inquiries prompted him to track down Shafer. Eventually, Johnson found Shafer and a friendship was born. In 2002, Johnson, Shafer and other alternative housing enthusiasts got together for a sort of grassroots convention. It was at this meeting that the group decided to start an association of sorts, a decision that resulted in the Small House Society, a group that still lives on today. The four founding members were Johnson, Shafer, Nigel Valdez and Shay Salomon. From that moment, the group started to grow from four to 12. Ironically, the following year Johnson commissioned Shafer to build him a tiny home, which, according to Johnson, was the first commercially built tiny home he knew of. Johnson moved into the home in August 2003. In May 2006, around three years after Johnson moved into his tiny home, NPR interviewed Johnson for an All Things Considered radio segment on the tiny home movement. The interview got national attention, Johnson said, and, within days of the segment airing, a publisher called him to work out a book deal. In 2008, the book, “Put Your Life on a Diet: Lessons Learned From Living in Less Than 140 Square Feet”, hit the shelves. The tiny house movement got arguably its biggest break nine months later in Feb. 2007 when Oprah decided to highlight Shaefer’s 96-square-foot tiny home. In the video, Shafer gives the cameras a tour of his home that looks like it could’ve been a part of any one of the wildly popular tiny home shows streaming today. Fate would have it that the emergence of the fledgling tiny house movement was perfectly aligned with the destruction of the mortgage crisis that rocked the United States. 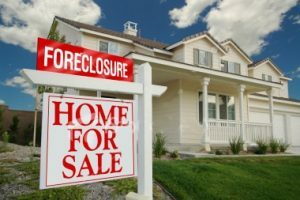 As hundreds of thousands of Americans foreclosed on homes and the housing market hitting rock bottom, consumers started to view homeownership differently. The dream of having a home was gnarled with a massive recession; there had to be a better way. For Millennials who saw their parents struggle through the recession, as well as the parents themselves, tiny homes became a more attractive option. The costs were low, the life was simple and the environmental footprint was minuscule compared to the average size home of more than 2,500 square feet. In the years following the Recession, the tiny house movement gained serious momentum. Books were being written, blogs were launching and associations were forming. Even entire towns were ready to invest in tiny homes. Spur, TX., a small enclave amid rolling prairies, officially declared itself a tiny-house town in 2014, welcoming tiny-home owners and relaxing the typical size and space restrictions on tiny homes. That same year, two popular shows about tiny homes launched – Tiny House Nation and Tiny House Hunters – serving to add to the national momentum the movement was building. These two shows served to take people inside the world of tiny homes, providing them with real-life examples of individuals and couples who made the small-home choice. Viewers from across the country were able to listen to the reasons why people were leaving their homes or apartments for tiny houses. And, in seeing the development of a tiny home from a dream into a reality, the shows helped to legitimize the movement on a national scale. Perhaps the most fascinating aspect of the movement is that it’s moved beyond solutions for individuals; cities are now considering tiny homes as a way to curb their housing crises. County commissioners in Miami-Dade County asked the mayor to consider tiny homes of 300 square feet or less as a solution for the lack of space for building new homes and apartments. “Micro houses would encourage the efficient use of land by accommodating greater population density in a smaller area,” the commissioners said in their ask. Boston is looking into tiny homes as a way to meet the demand of a city that, according to estimates, will grow to 700,000 people by 2030. Marcy Ostberg, head of the city’s housing innovation lab, talked with a local news station about the possibility of introducing tiny homes to the city’s zoning laws to help meet future housing needs. These two examples may hint at the future of housing as a legitimate cultural force reshaping the way cities are organized. All of this growth is something that excites Johnson, one of the original founders of the tiny house movement. However, what many people don’t know is that, early on, investors approached him and wanted to corner the market, get trademarks and copyrights and take literal ownership of the movement. Exactly how that would’ve worked out is a mystery, but, thankfully, we’ll never know. “Back then, it was about letting things grow as organically as possible with people taking their own approach,” Johnson said. Over time, the movement has gone through its transformation, blossoming into a full-blown cultural phenomenon that few could’ve predicted when Jay Shafer was the subject of a newspaper feature back in 2000.